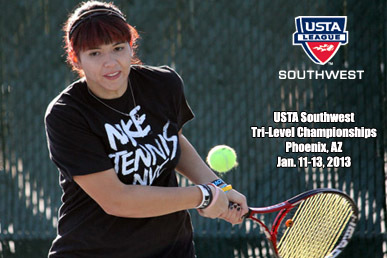 USTA Southwest will host the fifth annual Tri-Level League Championships on January 11-13, 2013 at the Phoenix Tennis Center. More than 120 players from across the Section are expected to compete in this "tri-level" format (named for the three different NTRP levels 3.5, 4.0 and 4.5) that make up each team. Tri-Level is a growing format in the Southwest and across the nation with more and more teams participating each and every year. The topper to participating in Tri-Level leagues is the invitational national championship each year that is held in conjunction with the BNP Paribas Open at the Indian Wells Tennis Garden in Indian Wells, Calif. Section championship winning teams get to compete at the same time as the top professionals are battling out for their own title! It's a pretty sweet spectacle and a great feel and environment. Section championship teams usually get tickets to the event as well, so not only do you get to play, but you get to watch the top pros in action. The BNP Paribas Open Tri-Level National Championships will be held in March 2013. Defending champions at the USTA Southwest Tri-Level League Championships are Central Arizona women and Central Arizona men. Winners of each men's and women's level will compete for the USTA Southwest team at the national championships.
. At this meeting captain's the final schedule of play for the tournament be given out for the tournament. Online registration is required of all players. The team registration form is due to the USTA Southwest office by December 21, 2012. A tentative schedule will be released on or after January 4, 2013. The Captain's meeting location was improperly listed in the original captain's packet. Please note the change: The correct location and time for the event is Thursday, Jan. 10, 2013 from 5:30-6:30 pm at the Half Moon Sports Grill on 2121 E. Highland Ave, Phoenix, AZ 85016 location. It is just a short drive away from the host hotel. The host hotel for the event is the Embassy Suites – Phoenix Airport at 24th Street. The hotel has been courteous enough to block off suites for Tri-Level Section Championships player at a rate of $119/night plus taxes and fees per suite. This includes complimentary parking, free cooked-to-order breakfast and a manager’s reception from 5:30pm to 7:30pm. Players can take advantage of a complimentary airport shuttle and Players should reserve directly with the hotel and identify themselves as part of the USTA Tri-Level Section Championships. Players should make their reservations by December 18, 2012. Feel free to make your reservations online HERE. Restrictions and provisions may apply on reservations. The facility is located less than three miles from the Phoenix Tennis Center, so it is convenient. It is also located close to the Biltmore Fashion Park, downtown Phoenix and Old Town Scottsdale which all houses plenty of great area restaurants and more.